What’s Really Going On In The Murray Darling Basin? 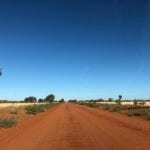 Home » Travel Outback Australia » Road Trips » Darling River Run » What’s Really Going On In The Murray Darling Basin? The Darling River is dying. It has been for a while now. Slowly, agonisingly dying. Self-interest lobby groups blame lack of rain. Politicians check with their mates in the aforementioned lobby groups and big agricultural companies, then release a statement with the appropriate gravity and solemnity. South of Tilpa, April 2018. This is simply politicians doing what they do best, i.e. living by their mantra of “If you tell a big enough lie and tell it often enough, it will be believed by the masses”. Yes of course lack of rain is a problem. But it’s not the root cause. And no, this article is not just another cotton industry-bashing exercise. Yes they have a major role to play, no doubt. However in New South Wales at least, there’s a bigger picture at play. One that’s not immediately apparent. What Else Is At Play Here? What’s In It For The Cotton Industry? Is Queensland Still In Australia? So what’s going on in the Murray Darling Basin? To answer this, let’s start with a pipeline no one wanted. Broken Hill relies on a water pipeline. Until recently it ran about 100km from Menindee Lakes to Broken Hill. So Broken Hill’s water came from the Darling River. But now, Broken Hill has a shiny new pipeline… running 270km from the Murray River at Wentworth. By piping water from the Murray instead of Menindee Lakes, then Menindee Lakes can be drained. Menindee Lakes are shallow therefore have a huge evaporation rate. So if the Lakes are empty then the water can’t evaporate. Far better to store the water in deeper storages. The implication here? By saving this water, it can be returned to the river. Warm and fuzzy images of water flowing down the Darling spring to mind. Alas, this is quite simply a lie, as you’ll see later. You’ll notice they usually add the term “man-made” when talking about Menindee Lakes. Wrong. They’ve been there way before we were. Yes they were modified and expanded, but the lakes have been there for many thousands of years. Before we go on, let’s look back at what Menindee Lakes were before they were turned into a commodity. Menindee Lakes were part of a chain of natural wetlands that were present along the length of the Darling River, way before white colonisation. Each wetland would fill during wet times and slowly release water back into the river, ensuring the river continued to flow, even in the driest times. This chain of wetlands ensured continuous flow of the river even in the driest times, and Menindee Lakes were a vital part of this chain. “Hang on”, I hear you say. “Hasn’t the darling River always gone through cycles of flooding then drying? It’s normal for the river to stop flowing”. Wrong. This is a myth. 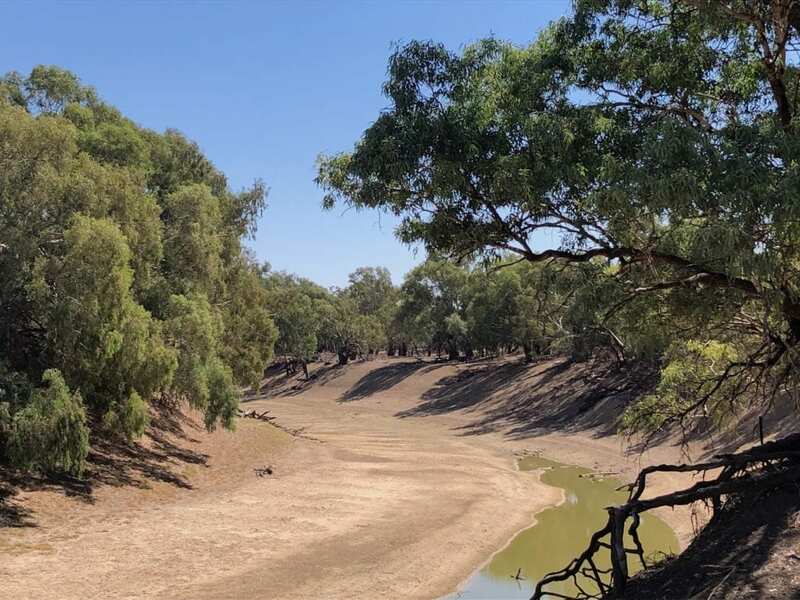 Check out this article, aptly titled “The Darling River Is Simply Not Supposed To Dry Out, Even In Drought”. By the way, the same lie has been perpetuated about the Murray River. The first time the Murray River stopped flowing was in April 1901 downstream of Morgan weir, due to pumping for irrigation during the horrific Federation drought. The context of the cease-to-flow events in the Murray River over 100 years ago was undisputed at the time, but lost in a generation. The impacts of irrigation diversions on low flows were well acknowledged by the governments and water authorities of the day, and all publications and newspaper reports at the time attributed these conditions to irrigation. Contrary to popular belief, this history is well known. Back to Menindee Lakes. In the 1950s and 60s, a series of canals, weirs, walls and barriers were built and Menindee Lakes were basically converted into an inland storage system. In theory, water was stored during flood events and slowly released in drier times. The mining town of Broken Hill used Menindee Lakes as their playground. People flocked here to swim, fish and relax. Sunset Strip was born, a place where the more affluent people from Broken Hill built holiday houses on the edge of the lake. The Broken Hill to Menindee road was a busy thoroughfare on any given Friday afternoon. And what about those wetlands up and down the river, what happened to them? Well, some still exist. But they no longer see the natural flooding cycle and most have disappeared due to soil compaction by hoofed animals introduced by the white man. In this flat country, even a road can be enough to divert water, which would have once flowed into a shallow wetland depression and then recharged the river. And a small levee bank can easily divert water many kilometres off its original course and into a storage dam. So the plan is to let Menindee Lakes dry out. But what about the marine life, the town of Menindee, the local landholders? If you drive through Menindee now, it’s a sad landscape of dead grape vines and orchards, vacant houses and the Sunset Caravan Park, perched on a bone-dry hill facing an empty lake. You’d think Broken Hill would be welcoming the pipeline with open arms. Nope, they don’t want it either. Menindee farmer Kate McBride said people in the area had been in tears. 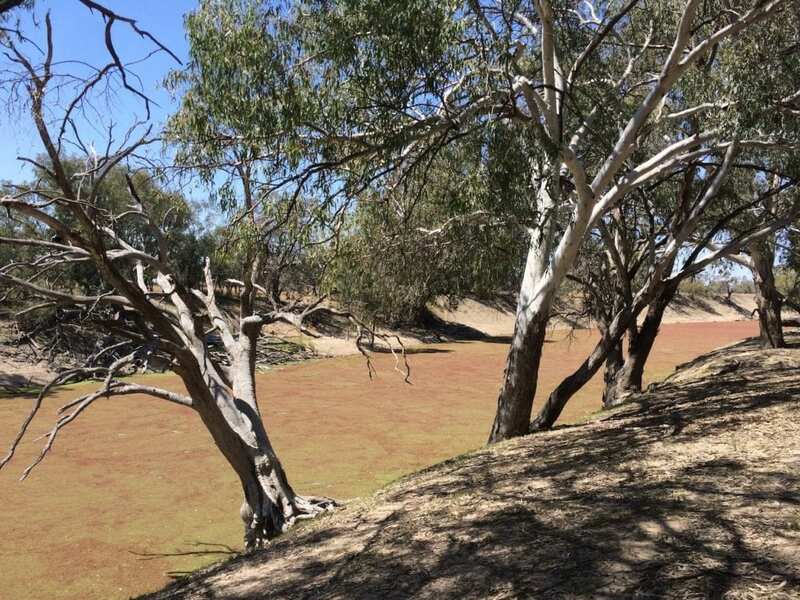 “The Menindee Lakes were drained twice within four years and each time it was drained it should have had seven to eight years worth of water,” she said. The Menindee Lakes are at 5 per cent capacity and are expected to be empty by the end of January. However Mr Blair (state minister) said it was a Federal Government decision to drain water from Menindee, and that the NSW Government only took control of their management when there was more than 480 gigalitres of water in them. And therein lies part of the problem. Buck-passing on a monumental scale. Broken Hill has a lot to lose as well. Menindee Lakes are the playground for locals. Boaters, fishermen, families. They all used to flock to Menindee, buying food, equipment, provisions in Broken Hill. Menindee Lakes, all but dry in October 2018. The plan is to maintain Menindee Lakes at about 20% of capacity. Hardly enough to wade in. On the face of it, reducing evaporation in Menindee Lakes seems like a good idea. “More water for the river” is the line touted by politicians. But what other benefits arise? Worse, this new pipeline has standpipes (take-off pipes poking out of the ground, fitted with ball valves ready for connection) at regular intervals. So if you live along the pipeline and want to buy water, you can. Does this mean we’ll be seeing cropping country along the Silver City Highway, cropping in what is effectively sand? Time will tell. And just how much water is going to be sucked out of the Murray at Wentworth? This river has been on life support for many years. The Murray isn’t really a river, more a chain of pools created by locks and weirs. What’s changed, has the Murray magically become an infinite resource? But what really gets my attention is Cotton Australia the peak body for cotton producers. They have fallen over themselves to laud the “foresight” of the NSW Government in securing Broken Hill’s water supply. I smell a rat. Well, Broken Hill doesn’t need Menindee Lakes’ water any more. You might remember the publicity when Broken Hill almost ran out of water in 2015. It’s not a good look for the government. Desperation of farmers and towns downstream who have to drink filthy slimy green muck from the Darling. Far better to go about their business of maximising profits quietly, away from the public eye. But the biggest benefit by far (for Cotton Australia at least) is the water that would once go into Menindee Lakes, can now be diverted upstream for irrigation. The NSW Government get to appear like they’re actually doing something for a change and the cotton industry can take even more water. Smoke and mirrors. A Four Corners investigation has found that in the Barwon-Darling system — a critical link in the wider Murray-Darling Basin — NSW Government water extraction rules have given irrigators more reliable access to water than prior to 2012 when the Basin Plan was signed. 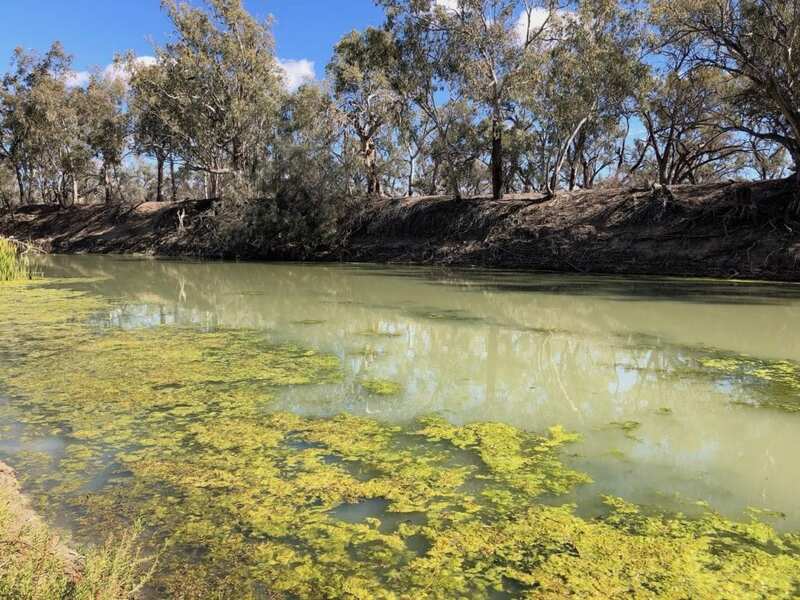 Long-time farmers’ advocate Mal Peters, who chaired a Murray-Darling Basin Authority (MDBA) statutory committee examining the Barwon-Darling, described the rules as “bloody disgusting”. “It rendered the whole plan, in my mind, completely null and void because the amount of water that could be taken out was huge,” he said. University of New South Wales scientist Richard Kingsford said the revelation “goes against the whole tenet of the [Basin] Plan”. “Environmental water bought by taxpayers is going through pumps into storages to grow cotton, and to me that is the biggest problem that we’ve currently got,” he said. However, unlike another big buyback also signed last March – which delivered a $37 million windfall for ASX-listed Webster Ltd headed by Chris Corrigan for its Tandou property water rights – the government this time redacted the independent valuer’s recommendation. Ed Fessey, who served on the North Basin Advisory Committee for the Murray-Darling Basin Authority, said the water sold by Mr Dundon only existed in one-off flood events, and is known locally as “goanna water”. “The only time you get it is when goannas are sticking their heads out of the trees [because of flooding],” Mr Fessey said. So a Federal politician strikes a deal with a big company to buy back water at twice market price… and water that only exists during the biggest flood events… and makes sure the independent valuer’s recommendation is redacted. Tell me that doesn’t stink. Still sceptical? Read this about how the $78M buyback was nearly double its valuation. According to the November 2017 Matthews Report, commissioned by the NSW government in the wake of the explosive allegations aired by Four Corners, most of the effective water controls and regulation do not apply, or are not complied with, in the Upper Darling Basin. Joyce confirmed in an interview with The Australian that the deal with Webster meant that some of the five lakes making up the Menindee storage system would be permanently “decommissioned”. The Australian reported that Joyce said letting the lakes dry out would save precious water for irrigators in the cotton communities of St George and Dirranbandi, in southern Queensland, and Bourke, Wee Waa and Moree in northern NSW. This was “a much better alternative than having to withdraw water entitlements from large cotton producers like Chinese-owned Cubbie Station, the biggest user of water in Australia”. Did I mention Webster Limited is a major donor to the National Party? Hang on, what about the farmers and towns downstream of Menindee Lakes? What about the town of Menindee itself? What about the fish, birds, livestock, wildlife who all need water from the Darling to survive? Hard to see here because they’re all dead, but… you’re looking at part of an extensive grape vine plantation north of Menindee, now dead. They all still need water. The lakes are supposed to be filled then slowly released to provide environmental flows and water for those downstream. Clearly that’s not going to be possible any more. People living between Menindee and Wentworth are worried, and with good reason. They can see the writing on the wall for the Darling. Removing Broken Hill from the Menindee Lakes equation frees up the NSW Government to completely change how the water is managed. 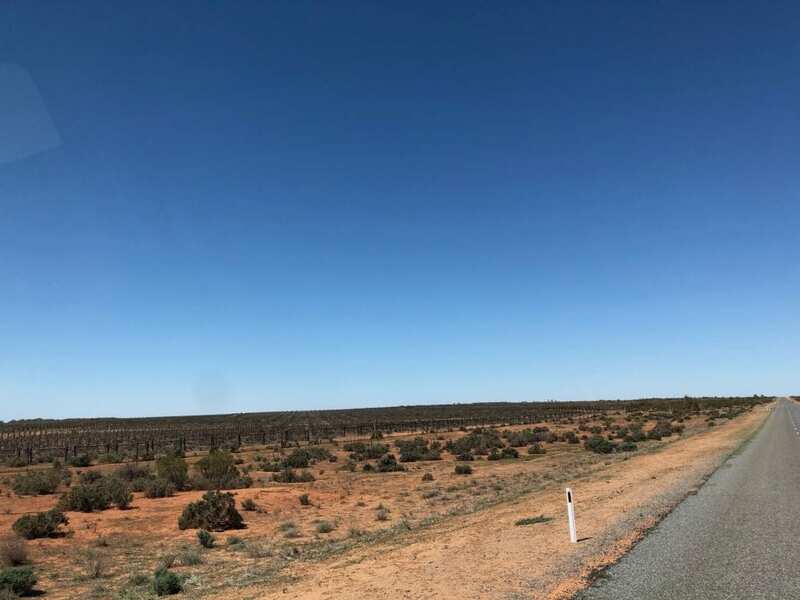 While NSW government insists the pipeline is a standalone drinking supply project, there can be no doubt that reducing Broken Hill’s reliance on inflows to the lakes frees the government’s hand to re-engineer the lake system. NSW plans to reconfigure the lakes to push water in-and-out faster and store it when necessary in deeper reservoirs, to reduce evaporation, which is estimated at 400GL to 600GL a year. The water savings would contribute to the water recovery goals of the Murray Darling Basin Plan, which allows states to swap buybacks of irrigation entitlement for the water efficiencies achieved through new infrastructure. Instead of storing water and releasing it over several years, the lakes can now be used as short term buffer storage. So rather than the consistent environmental flows that were supposed to be running down the Darling, the river would see short pulses of higher flows. Well, the NSW Government can’t afford to store water in Menindee Lakes. As part of the Murray Darling Basin Plan agreement, they have to meet water savings targets. And it just so happens, the evaporation off Menindee Lakes comes pretty close to making up the 350GL they still need in order to meet their target, as explained here. On paper it’s a neat solution. In practice it’s a different matter. Perhaps the NSW Government hadn’t actually thought this through. Or maybe they decided these farmers, communities and environment would be collateral damage. We’ll probably never know. So they’ve now come up with one of the dumbest ideas in the history of government… and that’s saying something! Why not build another pipeline, they thought? One that runs from Wentworth, up the Darling River to Menindee! 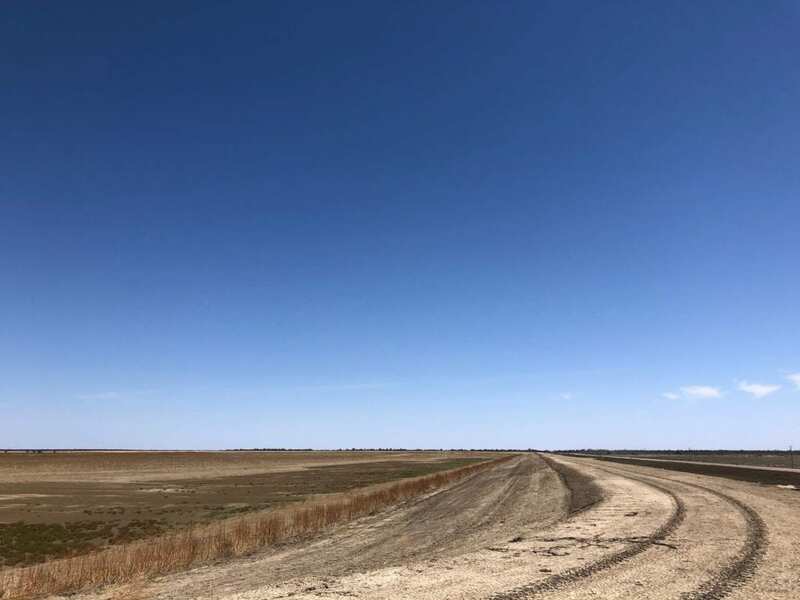 This would supply water to farms and communities downstream of Menindee Lakes, which to date have relied on water being slowly released from the lakes. In other words, replace the river with a pipeline. I’m lost for words. Some fool came up with this hare-brained idea. Instead of telling this person to have a few days off to get a grasp on reality, the pollies have jumped at it! Or maybe it was part of the plan all along. After all, it means Menindee Lakes don’t need water from the north any more. More water for the irrigators up north methinks. They’ve just spent $467 million on the Wentworth to Broken Hill pipeline, all so they can drain Menindee Lakes. Now they want to build another pipeline because they’ve drained the Lakes. Predictably, no one wants yet another pipeline… except the politicians of course. Would you want the Darling River replaced with a pipeline if you lived there? And why have they really drained the lakes? A cynic might suggest it has something to do with building a case for a pipeline from Wentworth to Broken Hill. We’ll effectively have a triangle of pipelines. The Wentworth to Broken Hill one terminates where the old one terminated (at Broken Hill) and the Wentworth to Menindee one will terminate where the old one started from (at Menindee). And to cap it all off, the Murray River will once again be called upon to supply the shortfall that’s now going to end up in huge irrigation ponds upstream. Is your head spinning yet? We’ve only just started! And while we’re on the Murray, let’s have a look at what’s happening upstream of the Murray. The Hay Plain is the flattest plain on earth. In dry times it looks like the surface of the moon. When you drive from Hay to Balranald, the Murrumbidgee River lies in the distance to your right. And it’s hot, very hot. We’re talking high 40’s in summer. In fact as I write this in January 2019, Hay recorded 46, 48 and 47 in the last 3 days. Yes it’s a heatwave, but not particularly unusual out there. 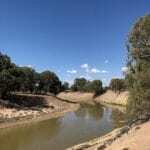 The Murrumbidgee flows into the Murray, providing a significant contribution to total flow in the Murray. With headwaters hundreds of kilometres away in the Snowy Mountains, the Murrumbidgee is a critical water source for the Murray River system. The river actually arcs northwards from Hay, like a stretched upside down U. It comes back south-west, passing through Balranald. Several years ago, a small cotton farm emerged from the soil with its telltale massive storage dams and canals running to and fro. It was on the eastern end of the Hay Plain, beside the highway. Somewhere between 2016 and 2018, the number of cotton farms along the Murrumbidgee exploded. From the road, the cotton farms seem to run halfway to Balranald from Hay. But when you look on a map and follow the Murrumbidgee, they run all the way to Balranald on both sides of the river. Zoom in, inside the square. Follow the network of irrigation canals and crops. And because the Hay Plain is so flat, the existing creeks can easily be turned into irrigation canals. For example, Nimmie Creek is barricaded where it meets the Murrumbidgee at Maude. Originally it would have been dry except in times of flood. It used to join back into the Murrumbidgee further west, but this has been blocked off. If you follows Nimmie Creek then follow the irrigation canals splitting off it, you’ll see they run all over the plain for hundreds of kilometres in total. The Murray Darling Basin Plan was legislated in November 2012. Yet this humungous irrigation project was developed well after this legislation came into effect. There’s been irrigation north of Hay since 1892, but nothing like the current scale to the west of Hay. The massive new gin (author: cotton processing facility) is being built by Auscott Limited. When it opens next autumn, it will be as big as any gin in Australia and plans have already been approved by the Hay Shire Council for it to double in size. This will make it one of the world’s biggest cotton gins. Cotton is second only to rice in the amount of water it needs (we’ll get to some numbers soon). Yet this is allowed to happen in one of the hottest parts of the state. An example of a turkey nest (cotton storage dam). Obviously this one is dry for now. This is just one of hundreds you’ll see in the Murray Darling Basin. You might juuuust be able to make out the far wall in the distance. Based on length, width and depth we estimate this one dam would hold about 20GL (20,000 million litres). Cotton advocates will no doubt jump on my statement above and declare the only reason cotton can grow here now, is that cooler climate varieties have recently been developed and this is what’s growing on the Hay Plain. So how can I say this is one of the hottest parts of the state? All I’ll say to this is have a look at Hay’s average summer temperatures. And what about evaporation rates? Have they been factored in? It seems to me like the evaporation issue at Menindee Lakes has simply been moved south to Hay. More on this soon. Not only is the Murray River expected to pick up the shortfall of the Darling River all the way up to Broken Hill. It’s also expected to deal with reduced flows because its tributaries are being sucked dry as well. This article by Grain Central from June 2018 describes how the Southern region had a record cotton crop in 2018. Ironically they try to spin cotton irrigation as being more water efficient than… rice! Who’d have thought?! And 2018? Wasn’t south-western NSW in the grip of a horrible drought? One which is still going as I write this in January 2019? Where did the water come from to grow a record cotton crop? And who missed out? 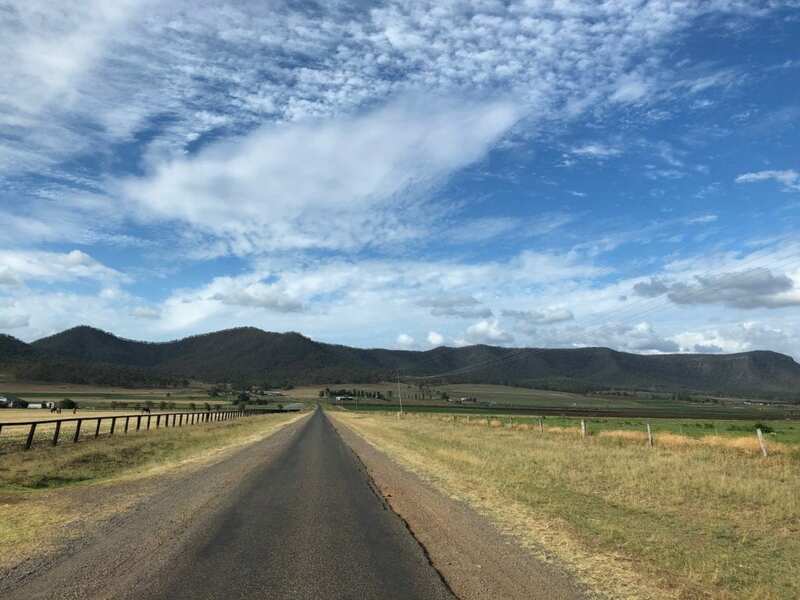 Quoting figures from the Grain Central article, 67,500Ha of cotton was grown in the Murrumbidgee Valley in 2018, using on average 9-10 ML/Ha of water. Their figures, not mine. Yes, that’s 9 to 10 million litres per hectare to grow one cotton crop… each and every year. 9 to 10 million litres on every 100 metre x 100 metre patch of dirt. For one crop. Multiply this by 67,500 Ha and you start to see the scale of the problem. How about 1,000 litres for every square metre. Or 100 standard 10 litre buckets on every square metre. And 67,500 Ha is the equivalent of 675,000,000 squares, each 1 metre x 1 metre. One more analogy. Sydney Harbour holds about 500GL (1GL is 1,000 million litres). In one year, cotton crops in the Murrumbidgee Valley used about 675GL. Imagine the equivalent of pumping Sydney Harbour dry and then some, to grow one type of crop. Do you think Sydneysiders would be willing to wear this? Let’s paint a picture. You look out over the harbour towards the Heads. You can’t see the Heads because they are obscured by yet another dust storm coming out of the harbour, blanketing the Eastern suburbs all the way to the South Coast and beyond in choking dust. If you could see the Heads, you would see an enormous concrete wall right across the Heads. A grand government scheme to fill Sydney Harbour with fresh water and use it to irrigate crops. And the stench is unbearable. Everything from oysters to whales are rotting in the bottom of the Harbour.Ferries lie tipped on their sides, many metres below the wharves. The massive irrigation pumps have fallen silent, there’s no more water to pump. And this has happened in less than one year. In less than one year, Sydney Harbour has been sucked dry. And the irrigators are complaining because they need more water. Rightly so, Sydneysiders are in uproar. Yet the water minister’s response is, “This has been caused by the drought”. The irrigation lobby nod their heads furiously in agreement, as they stand behind the water minister on national television. Now do you start to understand how frustrated people are all over the Murray Darling Basin? What about the dollars? World cotton prices are high at present, there’s good money in cotton. Again, quoting directly from this June 2018 article about record cotton crops in the Southern Region, the Southern Region grew a record 800,000 bales at about $650/bale, a good price. Remember, this is just one “small” section of water-intensive cropping in the massive Murray Darling Basin. Are you starting to see the scale of the problem… and the money involved? Scale this up to cover the entire basin and you’re looking at mind-blowing numbers. This article has some interesting figures and some really good maps on water usage for the Murray Darling Basin. No wonder the rivers are dying. Before we go on, let’s compare the surface area of Menindee Lakes with the total area of the cotton irrigation in the Murrumbidgee Valley. Earlier I said the NSW Government declared they were running down Menindee Lakes to prevent evaporation. On the face of it, a noble cause. Now Menindee Lakes when all four lakes are full covers 457 square kilometres, or 45,700 Ha. In comparison, the irrigation water in the Murrumbidgee Valley is spread over a total area of 67,500 Ha. This doesn’t include all the storage dams and hundreds of kilometres of canals, all of which are exposed to evaporation. And again, this is just one section of irrigation in the entire Murray Darling Basin. So that’s 67,500+ Ha of land and storage dams on which the water is spread out over. Of course, some soaks into the soil but how much evaporates? Does it still make sense to drain Menindee Lakes on one hand, yet allow massive expansion of irrigation on the other? Does it make sense to declare evaporation rates from Menindee Lakes are unacceptable, then allow water to be spread over a bigger surface area further south? I don’t think so. What if the NSW Government had simply left Menindee Lakes alone and not granted water rights to the massive cotton farms west of Hay? All they’ve done is transfer the evaporation problem south to the Murrumbidgee Valley. Ah, but hang on. That would mean irrigators upstream of Menindee Lakes would have their water allocations cut. Hmmm, that all sounds too difficult. Nope, not an option. Certain donors to major political parties would be most upset. If you think I’m being irrational and paranoid, read on. NSW must deliver 1,312GL per year of water back to the river systems by investing in water-saving projects. It is still 345GL short of the 1,312GL target. Evaporation off Menindee Lakes is about 425GL per year (when full, but somehow this doesn’t seem to enter the equation). 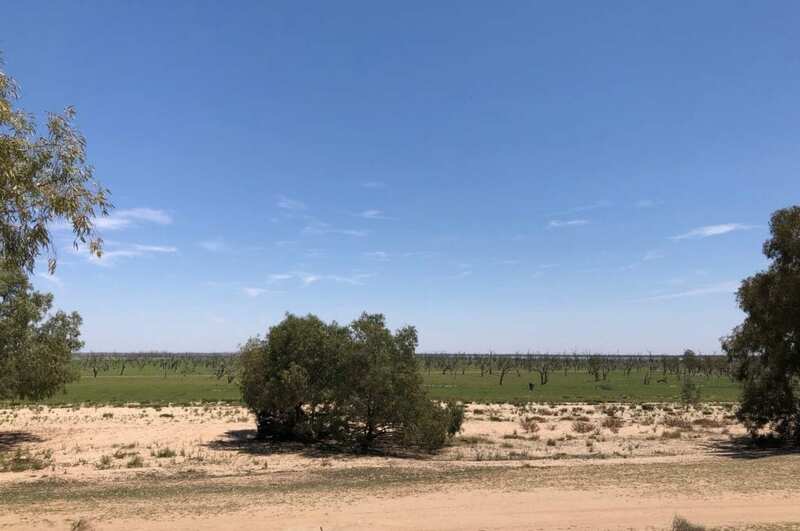 By draining Menindee Lakes, 425GL per year is saved and the NSW Government has met – even exceeded – its water saving target of 1,312GL per year. So on paper, the box has been ticked and the NSW Government can shower itself in glory about how wonderful they are. Irrigators have water licences. They are spread all over the state. The NSW Government looks at flows in a given river system and decides how much water to allocate. They might decide not to allow any pumping from the Lachlan River for example because flows are low. However they look at the Murrumbidgee and might decide flows are high enough to allow water to be taken. Hence the 675+ GL taken for the 2018 cotton crop. Or they might look at the Gwydir River system, see the dams upstream are full and allow water to be taken from the Gwydir. Water is released, the irrigators pump and everything is good on paper. Remember, they have now ticked the environmental box… they’ve met their 1,312GL water saving target. The thing is, none of the above scenarios actually look at how much water is actually flowing down the rivers. In the Gwydir example, on paper it doesn’t matter whether the flow release from an upstream dam reaches the end of the Gwydir River. On paper, everything looks great. On the ground, the rivers are dry. A question of semantics. And I acknowledge that I’ve oversimplified a complex system of water rights and environmental flows. However, I’m just trying to make sense of it all. And try telling me this water allocation system isn’t wide open to abuse and corruption. If I happen to be a big player with lots of water licences (and I might even donate to the political party in office at the time), I might just expect to be given preferential treatment. The small players, the small family irrigators seem to be missing out on water allocations when the big companies somehow seem to get what they need. It seems every river in the Murray Darling system is under stress. As just one example, let’s follow the Murrumbidgee further upstream. We’ll have a look at a couple of spots. I’m not singling them out for any reason, other than to point out the scale of the problem. They are simply examples of the scale of mis-management of the entire Murray Darling Basin. Let’s look at the Murrumbidgee from Jugiong to Gundagai and downstream of Gundagai. This is fertile country. The wide river flats and cooler climate allow crops like lucerne to flourish on the rich Murrumbidgee river flats. Many of these crops are irrigated. This is not an issue when looked at in isolation. After all these soils really are fertile. It makes sense to be adding water to fertile soil in a temperate climate, to grow crops we eat or crops for livestock. But how is this managed? Who is looking at the big picture? Who is monitoring, policing, ensuring compliance? Again, I’m not saying the irrigators in this area are doing anything illegal. And I’m not necessarily saying they are allowed to take too much water. I don’t know their individual circumstances, this is irrelevant here. What I’m saying is, who is actually doing the checks and balances… not just around Gundagai but all over the Murray Darling Basin? After all, whatever water is taken from the Murrumbidgee is water lost forever to the Murray… all the way to the Coorong. Now we’ll go further upstream, past Canberra. After the Millennium drought, Canberra needed to secure its water supply. A pipeline was built from the Murrumbidgee River at Angle Crossing (south of Canberra), up over a mountain range, into Burra Creek which flows into the Queanbeyan River, which then flows into Googong Dam. Googong Dam supplies water to Queanbeyan and Canberra. The pipeline is capable of pumping 100ML per day out of the Murrumbidgee. When Googong falls below 62%, pumping starts until the dam is 80% full. “We did operate for a number of weeks, two or three months ago,” business services general manager Jane Breaden said. So when they most needed water, the water wasn’t there to pump. Hardly rocket science I wouldn’t have thought. The company (author: Icon Water, who own and maintain the pipeline) said in September water restrictions were unlikely to be needed for 20 years based on climate modelling, current storage and consumption levels, despite farmers on land surrounding the capital struggling through drought. However an ACT government spokesman said water restrictions could be brought in sooner if dry conditions persisted. Wow. It sounds like something from the 1950s. Unlimited water, no water restrictions, nirvana. Downstream, the Murrumbidgee is struggling, the Murray is all but dead… yet upstream they have as much water as they want! Once again, this highlights the mess the Murray Darling Basin is in. Let’s now go north and have a look at what’s happening in the Darling River catchment. With the Menindee Lakes effectively empty, where’s the water coming from to fill them? Two things recently occurred which highlighted the dysfunction of the Murray Darling Basin Plan. The first was our recent trip along the Darling in October 2018. We had been there in April 2018, hoping to see the headwaters of the significant March 2018 rain event in Western Queensland. We did in fact see a small flow in April. Exciting to see the river finally getting some water, but hardly a raging flood. More like a trickle. By the time it reached Tilpa, the water was all but gone. It shouldn’t have been this way. Given the large falls in the northern catchment, the entire Darling River system should have been well and truly flushed out. Perhaps it was because things like this were happening. Massive harvesting of floodwaters and the MDBA can’t do a thing about it. Over 52 kilometres of earthworks running straight across floodplains, earthworks funded by the MDBA and carried out by Cotton Farmer Of The Year, John Norman. Thankfully, Norman has since been prosecuted after an extensive criminal investigation uncovered a $20M fraud carried out by Norman Farming. I’ll be watching the outcome of the trial with interest. “I’ve learnt a lot,” Mr Glyde told 7.30. Although he admitted floodplain harvesting was a serious issue, he acknowledged there was nothing the authority could do in relation to the approval and regulation of irrigation earthworks. “There’s overlapping responsibilities: local, state, different departments,” he said. Full marks to Mr Glyde for visiting. But in typical bureaucratic fashion he ducked behind a wall of bureaucracy. On Wednesday, the Senate decides whether to pass a proposed reduction in the amount of water Queensland irrigators give back to the ailing Murray Darling River system. “We don’t want the irrigators to be keeping even more water, we want the banks pulled down in Queensland,” Mr Lamey said. Then in August 2018 we spent time around Wentworth and Pooncarie. The river was desperate. Even then, the algal blooms were thriving. The river was no more than stagnant pools of disgusting green slime. The stage was set for a disaster when the warm weather arrived. And this is exactly what happened. August 2018 at Pooncarie. The algal blooms had already started. By the way, this is the drinking water for Pooncarie. Would you drink this? 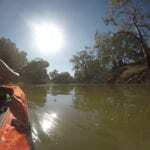 We returned in October, picking up the river at Menindee and following it to Brewarrina. Menindee Lakes were virtually dry and the entire river was sick. It was visibly worse, the algal blooms had already grown. A depressing sight. We left the river, driving east to Walgett, Moree and through Warialda. East of Moree, the drought had eased. In fact, some areas appeared to have had significant rain. Now this road follows the Gwydir River. Imagine our surprise when we saw crops being irrigated! What’s going on here? The Gwydir is a tributary of the Darling, the bone dry Darling River we had left only a day earlier. Yet obviously farmers along the Gwydir had water allocations! How the hell does that work? Our second piece of “Murray Darling Basin Plan madness” was in south-east Queensland in January this year (2019). We camped at Main Range National Park for a few days. This is south of Toowoomba, near Cunninghams Gap. Dalrymple Creek flows down the unbelievably lush rainforest valley and into the Condamine River. This is basalt country. Deep black soil and high rainfall. Yet it was clear they needed rain, even the rainforest looked stressed. It’s also part of the Murray Darling Basin. As Dalrymple Creek meanders down the valley, it is used to irrigate the rich black soils of the valley. Ironically we heard about the massive fish kill around Menindee as we drove past huge irrigation sprinklers sucking water out of Dalrymple Creek… a tributary of the Darling River! This Queensland valley within the Murray Darling Basin was being irrigated when we were there in January 2019… at exactly the same time as a mass fish kill near Menindee. Try telling me the Murray Darling Basin Plan is working. I don’t think so. States are acting like they are separate entities, disconnected from adjoining states downstream. And not just Queensland. New South Wales are doing exactly the same thing to Victoria and South Australia. Even the ACT, as you saw earlier. One of Webster’s directors, Joe Robinson, told Four Corners the company was not to blame for pumping environmental flows. “I agree that if there’s a flow that triggers my pumping and that means it does not get to your town, I agree there’s a major problem,” he said. With our diverse operations, our success is built around our strong and sustainable asset base and our ability to leverage this scale through our technical expertise for the ultimate benefit of our shareholders. The expertise of our staff and business partners, together with the significant opportunities afforded by our land holdings across the Murray Darling Basin, provide a significant platform for Webster to grow our agricultural division to a large scale, sustainable commodities business. Obviously share price is way more important than the communities they operate in. Do these big companies care when towns like Walgett run out of water and people are transporting bottled water from as far away as Wollongong… just so people have water to drink? The Darling River is no more than a disgusting slimy green irrigation channel. Despite this, it is captivating. There’s something special about camping beside the Darling, with those giant river red gums keeping a silent vigil. Upstream of Tilpa in September 2014. You’re looking at a 6 inch thick solid mat of weed completely covering the river. When this died and rotted later in the year, the river was a stinking, putrid mess. Unfortunately though, the future’s not bright. How can it be when politicians use the Murray Darling as a tool to point-score, caring more about their short-term careers than an ancient waterway in its death throes? And big business treat the rivers as nothing more than a resource to be used and abused until the water has gone and the topsoil blows away. And what of the Murray River? It has been beaten and flogged to death since white man first laid eyes on it. Nothing has changed, it just gets worse. It’s time to stop looking at these rivers as a resource to be used until nothing’s left. Large tracts of the Murray Darling Basin will be nothing more than desert pretty soon if we don’t wake up to ourselves and sort out this mess. The Barkindji people or “people of the river” have long recognised the river (or Barka) is dying. They’ve agitated to bring this issue to the attention of politicians and the general public, without much success. The system has reached a tipping point, one from which we won’t be able to recover. Answers to some questions you might have. What is the Murray Darling Basin? It is a complex system of over 77,000km of rivers. Waters from the Great Dividing Range flow west into the basin, joining until they form the Darling and Murray Rivers. The Murray eventually flows into the Southern Ocean in South Australia. Go here for details. Where is the Murray Darling Basin? It includes all of the ACT, 75% of NSW, 50% of Victoria, 15% of QLD and 8% of South Australia. How big is the Murray Darling basin? 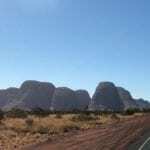 More than 1 million square kilometres or 14% of mainland Australia. Why is the Murray Darling basin important? It is home to hundreds of species of native animals, providing food and breeding grounds. It is Australia’s main agricultural region. It supplies water to millions of people including Adelaide. What is the Murray Darling Basin Plan? It is supposed to protect the basin from overuse, ad hoc planning decisions and to monitor and control water usage. Go here for a clear explanation. Where does the Murray River start? It starts on the western slopes of the Australian alps. Where is the Murray River? It forms the border between NSW and Victoria, then flows through the south-eastern corner of South Australia, into the Southern Ocean. How long is the Murray River? 2500km from the headwaters in the Australian Alps to the mouth at the Southern Ocean. Where does the Darling River start? 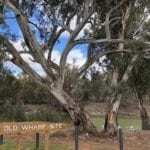 It starts in northern New South Wales and runs into the Murray River at Wentworth at the NSW/Victoria border. Where is the Darling River? It is in New South Wales. How long is the Darling River? It is 1,472km long, the third longest river in Australia. For articles on The Darling River Run, go here.